“Merely because the Laser Therapy cannot give so much relief, which open surgery can, the Doctors performing Laser Therapy cannot be attributed with negligence“.. These were some important observations made by the NCDRC in its recent judgment dated 04/07/2017, where the National Commission came to the rescue Doctors and the Hospital in the case of RAM KARAN CHOUDHARY V/s. BHANDARI HOSPITAL & RESEARCH CENTRE, JAIPUR & ORS. 1. The case is of the year 2002. The petitioner complainant suffered from pain in his back and right leg and was further advised to LADD (Laser Assisted Disc Decompression) operation of L 3-4 and L 4-5. 2. 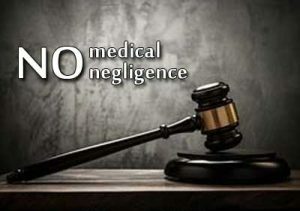 It was alleged in the Complaint that the doctor was negligent as during operation on 4.10.2002, he operated upon L 4-5 and L5-S-1 in place of L 3-4 and L 4-5 and as such the pains were continued, the Complainant had to got himself admitted at SMS Hospital on 10.12.2002 where he underwent another surgery. 3. The case of the petitioner is that relevant records such as the discharge summary and prescriptions post operation were overwritten to show that the operation was conducted upon L 3-4 and L 4-5 whereas in fact it was not and hence he demanded Rs. 4 lakhs in total towards compensation. 4. The Doctors denied all the allegations and contended that after MRI and other investigations, LADD was advised as the proper course of treatment, arguing that this method had several advantages vis a vis open surgery. 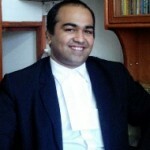 After taking consent, the Petitioner was operated on L 3-4 and L 4-5 as clearly evidenced from the operation notes maintained by Dr. Deepak and post LADD, the petitioner had improved . 5. It was also argued that the subsequent open surgery was quite different and therefore non-comparable with the LADD. Further overwriting on prescription and discharge summary simply a case of a human error which was rectified and further found support in the Post Laser Therapy Report that the surgery was performed on L 3-4 and L 4-5 only. 6. Both the District and state Forum dismissed the Complaint..
1.It was observed that the pre and post operation MRI reports confirm that the operation was performed on L3-4 and L4-5 and further there was improvement in said area as per post operation MRI. 2. The Doctors opted for LADD after taking consent from the patient as it was the best option based on the information available as against open surgery. 3. No doubt the Doctors admitted that there was overwriting on discharge card mentioning in L 4-5 and L5-S-1 in place of L 3-4 and L 4-5, which was corrected later on. But that by itself did not support the contentions of the Petitioner of wrong surgery, as the Petitioner was improving and the Post-op MRI also confirmed about the correct operation. 4. it relied upon the observations of State Commission that “Merely because the Laser Therapy cannot give so much relief, which open surgery can, the Doctors performing Laser Therapy cannot be attributed with negligence”..
4. IT was further observed that “the overwriting is very deliberate and very clear, the kind that is done to correct an error apparent rather than cover track for which use of fluid or careful artistry to fudge is more likely”. Further there was no mention of this allegation/defect in the legal notice sent by the Petitioner !! This case emphasises the need of proper and correct documentation. Had there been no improvement in the patient, then Doctors would have ended up in paying few lacks of rupees for “the typographical” mistakes !! Thus documentation and moreover correct documentation has been upheld by the Courts so far while granting reliefs in favour of Doctors.